Last night on my walk home, I noticed a huge neon sign in the window of my local pizzeria that read, "NO MSG." Huh, I thought. Is that a thing? I'd never known I was supposed to worry about MSG in my pizza—although, to be fair, I don't worry about MSG in anything, at all, ever—but apparently it was a big enough issue that it warranted a permanent disclaimer MADE OUT OF MAGIC GLOWING GLASS. Huh. A thing, I guess. And then this morning I opened up my feeds to find this headline yelling at me: "If You’ve Ever Eaten Pizza Before, This Will Blow Your Mind (Maybe Literally)." A weight loss blogger named the "Food Babe" (BUT HOW CAN A BABE EAT FOOD!?!? IT DEFIES ALL LOGIC) got curious about what was in her pizza-chain pizza and started poking around. 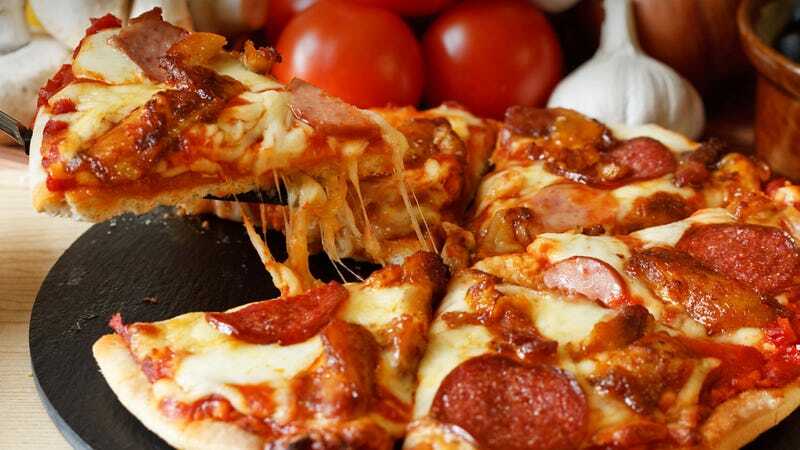 To her surprise, most of Big Pizza—including Little Caesars, California Pizza Kitchen, Mellow Mushroom, and Papa John's—outright refused to release their ingredient lists. Which is really not something you want to hear about a substance you're about to put in your mouth, mash up real good with your teeth, swallow, and then transform into a part of your body. Why are the ingredients so hard to find? Why are they refusing to share their ingredients? What is it that these pizza restaurants don't want us to know? Well, I'll tell you what they're hiding: Lots and lots of hidden MSG! Restaurants don't want to get a bad rap by putting monosodium glutamate (MSG) on their ingredient or allergen statements, so they have found another way to secretly add this potent flavor enhancer to your food, without the average customer realizing it. Instead of letting you know that they are putting MSG in your food, they are using an FDA loophole to sneak processed free glutamic acid into your food, which has the same effect as MSG – all without warning you. They simply use other forms of free glutamic acid (such as Hydrolyzed Soy Protein), which is the main component of MSG. This allows them to have "clean labels" and deceive us into believing their product contains no MSG – when it actually does! Trickery is shady. Feeding people secrets is shady. Also, deliberately turning food into a cheap, addictive drug is shady. Stop doing that, food industry! You guys are gross jerks! But I'd like to take one moment to lodge a dissent against the knee-jerk assumption that MSG (or, rather, glutamate) is deadly brain-poison. Now, limiting processed foods is definitely a bitchin' idea if that's something a person decides to prioritize, but the hysteria surrounding MSG seems unnervingly similar to the fuzzy public distrust of other "chemicals" and "toxins" (see: "vaccines gave my child autism" and, conveniently, "cutting out MSG cured my child's autism"). American disdain for MSG also feels vaguely xenophobic—there's a nagging subtext of, "PANIC!!! THE CHINESE ARE POISONING US WITH CHEMICALS FROM THEIR EVIL FACTORIES." The fact that MSG is so prevalent in processed foods does not mean that it is an "unnatural" product or inherently bad for you. I'd wager that eating grease-soaked, mass-produced, highly processed pizza covered in rubber cheese and pre-frozen meat discs might be the more significant nutritional variable in this equation. But enough hunches. I reached out to my most trusted #1 science friend (who asked not to be named, because of fancy scientific publishing reasons) for a little more concrete background. What's the deal with this whole MSG controversy? Like everything to do with biology, it's complicated. Glutamate a.k.a. glutamic acid is a commonly found amino acid. As such it is inside many of the essential proteins that our body makes. Because our body craves amino acids, we have special sensors on our tongue that allow us to taste free glutamate ions, and they taste savory. Glutamic acid is the only way to taste the savory umami flavor. Unlike the other four tastes, we have glutamate sensors all over our tongue. So the glutamic acid part of MSG is not harmful in small quantities. Neither is the sodium part, since this is just half of salt. However, either part of the molecule can be harmful in great quantities. "Chinese food syndrome" is probably nothing more than overconsumption of sodium. Also, at extremely high concentrations glutamate can move through the "blood-brain barrier." Once inside the brain it can be a neurotoxin. Does it actually cross the barrier? The answer is probably not, but the MSG wackos say yes. It's very interesting—glutamate is a neurotransmitter. It is found in very high concentrations inside neurons but extremely low outside. As an illustration of how glutamate is an essential part of all living organisms, it's represented in the genetic code by either GAA or GAG. That means you can read through our genome and see all the proteins we make that require glutamate. It is not an "essential" amino acid (meaning that we have to eat it in our diet), because we can make it from other things. But we need to have it to function. So it is an entirely "natural" product. So, should we eat MSG? Or shouldn't we? I'm beginning to see MSG like sugar. If you examine the molecules themselves you'll conclude that they're a natural part of our diet and we've been eating them for a million years. But, examine the concentrations you find them in in many modern foods and the story is not so straightforward. Well, there you go. Make your own choices about whether or not to consume MSG, and in what quantities. Be cautious and informed. Don't overdo things. Demand transparency from your food providers. But remember: Like so many ingredients, when used in moderation, MSG can function as not just a flavor-enhancer but a LIFE-ENHANCER. Apparently &apos;Butter Is Back.&apos; I Didn&apos;t Realize It Had Gone Anywhere. TTYL; I'm starving and this pho isn't going to spill itself down its cleavage.